We recently published an article naming Jupiter “the best planet.” As everyone knows, Saturn is the best planet. We regret the error. Last October, The Atlantic published, “Jupiter Is the Best Planet,” an article by Adrienne LaFrance. As editor of that article, I must take responsibility for the way it misled readers. In cases like this, we usually append a correction to the original article, but here the error is so grave that a freestanding editorial mea culpa is required. Jupiter is not, as LaFrance asserts, the best planet. That honor rightly belongs to Saturn. LaFrance was right to choose from the outer planets. With the exception of Earth (off-limits in this exercise) the inner planets are a bore. Mercury is a tiny thing, sun-blasted and crater-pocked, more moon than planet. Venus glows lovely in the sky, but its atmosphere is a hellish, sulfur-smelling place, with temperatures hot enough to melt lead. Probes sent to its surface survive less than an hour before succumbing to the extreme conditions. Venus is useful only as a cautionary tale about the runaway greenhouse effect. We are told that Mars was once a blue marble, coated in oceans and swirling white clouds. But today it’s a rusting, dried-out husk, stripped of its atmosphere. The ubiquity of Mars in pop culture has everything to do with its proximity to Earth, and nothing to do with the planet itself. Jupiter—or “good old Jupe” as LaFrance sweetly calls it—is a fine planet. It is, as she notes, the largest in our solar system. But there is something a bit gauche about Jupiter’s size, something akin to the sad glory of a prize-winning giant pumpkin. Given its dull, beige-dominated color scheme, Jupiter has to lean hard on its superlative size in order to be noticed. Like its namesake, the sky god of thunder and lightning, Jupiter is all shock and awe, all brute, all bully. Jupiter is the beast to Saturn’s beauty. Think of Saturn hanging in space, glowing like a streetlamp in fog, the tilt of its record-groove rings suggesting something imaginative, or even mad. Though it’s a giant planet, second only to Jupiter in size, Saturn somehow manages to give off an ethereal vibe. And it’s not only a vibe—were there an ocean large enough to contain it, Saturn would float. 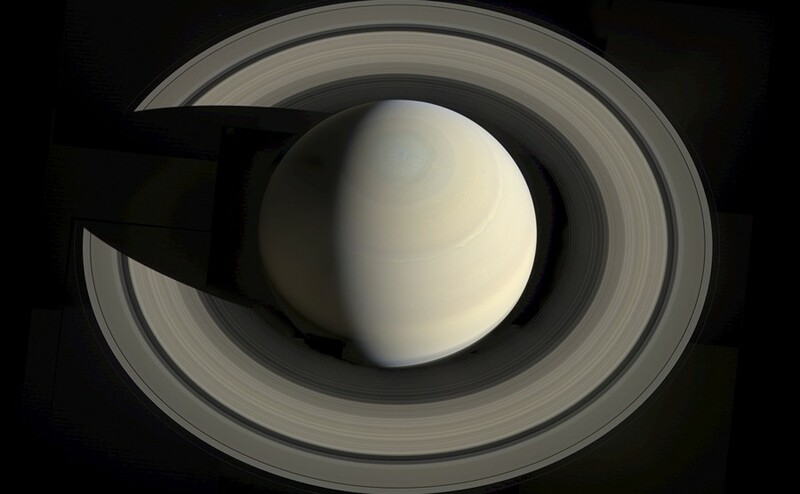 “Seen for the first time through a backyard telescope,” writes Dava Sobel, in her book Planets, “ringed Saturn is the vision most likely to turn an unsuspecting viewer into an astronomer forever.” Carolyn Porco, imaging lead on NASA’s Cassini-Huygens mission to Saturn, confirms Sobel. “For me, it was my first cosmic connection, on par with a first kiss” Porco told me. “No other planet looks as unworldly or surreal as Saturn. When you see it floating in the eyepiece of your telescope, you feel as if you’ve uncovered mystery in the cosmos.” Talking to astronomers or reading histories of the discipline, you often encounter this idea—that Saturn is the solar system’s seat of cosmic mystery. Saturn’s owes part of its mystique to its antiquity. It may be the solar system’s oldest planet. Like Jupiter, Saturn formed shortly after our home star first ignited. We know this because unlike Uranus, Neptune, and the smaller planets, Saturn is rich in helium and hydrogen leftover from the Big Bang. By the time the other planets formed, much of the hydrogen and helium in the solar system’s primordial cloud was gone. Saturn is a representative sampling of that cloud, a time capsule from the sun’s first dawn. It’s dead-star stuff mixed with gases from the beginning of time, sculpted into sublime form by more than 4 billion years of gravity. Orbiting twice as far from the sun as Jupiter, Saturn is the most distant planet visible to the naked eye. Humans may have spotted it more than a million years ago. You can picture some keen-eyed prehistoric dreamer stepping away from a campfire and finding, amidst a sky blazing with stars, five that didn’t twinkle, with Saturn moving slowest of all, due to its long orbit. The oldest recorded observations of Saturn come down to us from the ancient Assyrians, who nicknamed Saturn “Lubadsagush,” or “oldest of the old,” perhaps because of its stately movement across the sky. The ancient Greeks also imbued Saturn with age, naming it after Kronos, the Titan father of Jupiter, who reigned during Hesiod’s Golden Age. The Romans honored this figure with their most popular holiday festival—Saturnalia—the late-December cultural ancestor of Christmas, when, among much other drink and merriment, Roman masters performed table service for their slaves. But none of these ancients knew the full extent of Saturn’s beauty, because none could see its rings, with the possible exception of New Zealand’s Maori people. Descendants of the voyaging Polynesians, the Maori were skilled readers of the sky. “Parearau,” their name for Saturn, means “surrounded by a headband.” That’s a tantalizing etymological detail, to be sure, but so far as we know for certain, Saturn’s rings went unseen until 1610, when Galileo spied the planet through a revolutionary new technology: a long tube bookended by lenses. And even Galileo didn’t identify Saturn’s rings as rings. He thought Saturn had two small planets or moons poking out from it sides. Several years later, he would again fix his gaze on Saturn, and to his astonishment he found the two neighbors had vanished. The origins of Saturn’s rings are still in dispute. Some planetary scientists think they formed at the same time as Saturn. Others suspect the planet’s gravity shredded one of its moons only a few hundred million years ago. (In 20 million years or so, Mars will likely shred one of its moons into a ring.) To investigate this mystery and many others, NASA has slung four space probes out to Saturn, beginning with Pioneer 11, which left Earth in 1973, with Saturn as its final planetary destination. It was the Pioneer probes and their successors, the Voyagers, that achieved this epochal feat, sending back the first flyby images of Saturn, and the solar system’s other planets. But the most glorious mission in the history of Saturn’s exploration, and the history of planetary science as a whole, is the Cassini-Huygens probe, which marked its triumphant 2004 arrival at Saturn by gliding through a gap in its rings. In the years since, Cassini-Huygens has sent back so many memorable images, that it’s difficult to pick favorites, although we have tried in the gallery above. There are quite a few targets to choose from. Saturn has more than 150 moons and moonlets, and something of the planet’s sublime aesthetic seems to have rubbed off on them. Beneath the icy outer shell of Enceladus, the most beautiful moon in the solar system, an ocean that may support life sloshes. From the blue-lined cracks in its frosty white surface, geysers of glittering ice particles stream out into space, providing fresh material for Saturn’s newest ring. Titan, another of Saturn’s moons, is larger than Mercury. And unlike Mercury—or Mars for that matter—Titan has its own atmosphere, which is home to some of the richest, most complex chemistry in the solar system. (The most complex known chemistry exists inside living organisms.) Some have even suggested that Titan could support life, either alien forms based on the liquid methane that flows on its surface, or water-based life in the ocean beneath. Even Saturn’s smaller, more mundane moons and moonlets contribute to its beauty, by stirring patterns into the planet’s rings. The dynamic relationship between the moons and the rings rewards close study, for while there are rings around all of the solar system’s giant planets—even Jupiter—the others are mere wisps compared to Saturn’s. And if you’re an astrophysicist, a robust ring system is a useful natural laboratory. “Every type of ring behavior we have seen around Jupiter, Uranus, or Neptune can be found in orbit around Saturn,” Carolyn Porco told me. “And Saturn’s ring system offers the greatest promise of understanding processes in operation within all disk systems, not just those found around planets.” That includes disk-like clouds of gas and dead star stuff like the one that birthed the sun, and spiral disk galaxies like the Milky Way. In other words, the Saturn system is a microcosm in Plato’s original sense: It’s a smaller version of a pattern that exists at many scales across the cosmos. Saturn’s rings are made mostly of ice, or objects coated in ice. It is this ice that allows the rings to shimmer—even in the dim sunlight beyond the asteroid belt—announcing the remarkable ubiquity of water in our solar system, and perhaps the universe at large. The rings announce something else, too—something that might explain why they are so often identified with cosmic mystery. To a particular bent of mind, the rings’ sheer aesthetic strangeness suggests that many unimagined wonders may be waiting for us in the starry reaches of our galaxy and beyond. They tell us that nature may have many fantastical permutations, unknowable to us who see so little. The rings are a spur to the scientific imagination. We are lucky to have evolved while they still circle the planet. In 50 million years, they may have vanished, and not due to the perspective trick that fooled Galileo. Some researchers suggest that by then, Saturn’s gravity will have slowly pulled the rings in and swallowed them. After the rings are gone, and a suitable time of mourning has passed—millions of years, at least—Jupiter might have a shot at being the best planet. But not a moment before. If you’re a science writer or a scientist and you’re partial to Mercury, Venus, Mars, or Uranus (Neptune is already spoken for) please get in touch at science@theatlantic.com.